Meet our very first Northland Nine candidate PsychoSis. 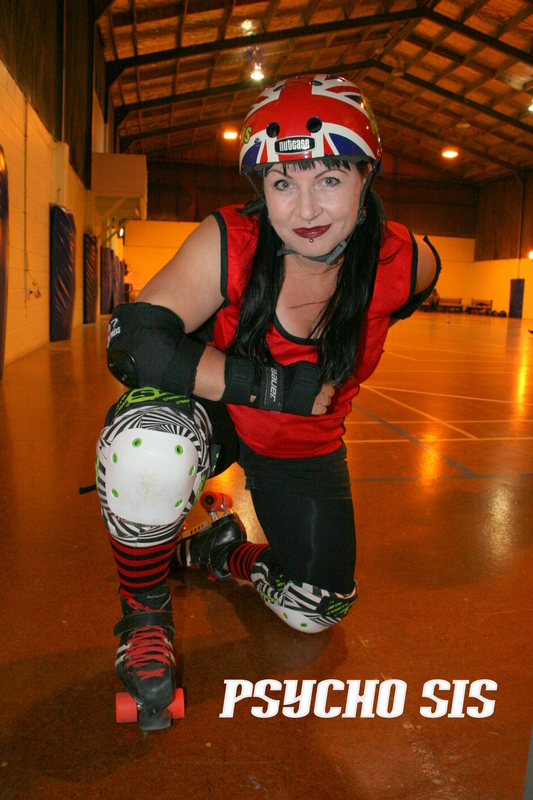 This naughty but nice player for Hell’s Wives lives in Whangarei and says roller derby kickstarts her heart. She also says she is not afraid of a little pain. We think she’s an ideal candidate for our very first Northland Nine treatment. From: I come from a little village in Wales called St Athan but am now living in Whangarei, NZ! Position: I will skate any position on track but prefer pivot cos I’m loud and bossy (on track). Currently skating on: Revenge plates, Bont boots and Adonis micro wheels (88a’s). 1: Three words to describe you? 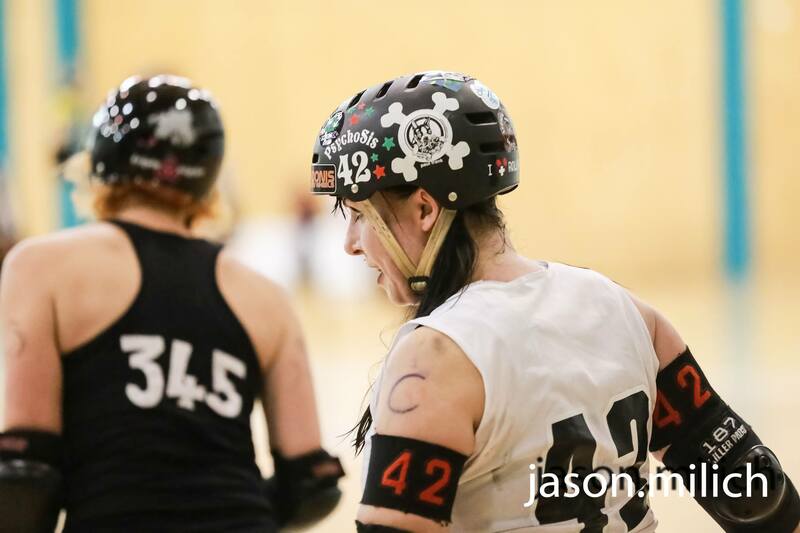 2: What’s your ultimate roller derby tune? Oh toooo many – let’s go with the sounds that made me haul arse during my laps – Cyndi Lauper – Girls Just Wanna Have Fun! (yep I’m an 80’s girl). But I’d also have to mention Kickstart My Heart by Motley Crue (great intro), Don’t Stop Me Now/Mr. Fahrenheit by Queen, Black Betty – Spiderbait version…….like I said I could keep going for ever. 3: What inspired your derby name? My darling brothers (I have 2) they never started calling me “Sis” until I left the UK to live here in God’s Own. It always gives me the warm fuzzies when they call me it, family is good……….and they would also agree that I am a bit of a Psycho. 4: What was the most memorable moment in your roller derby career so far? Ah there’s two. Winning our first game as Hell’s Wives against Mount Militia’s Dangerous Curves in Nov 2011. And my last game in 2014, I was playing pivot, there was a star pass to me and I dug in and got around on second scoring passes. Ah the stuff dreams are made of *sigh* ………now to repeat! 5: What are you most afraid of in life? Honestly? Getting old, positively terrifying. 6: What is the best roller derby advice you have ever received? Get used to pain and falling over, fall over lots, get up, repeat. DONT BE SCARED!!!! 7: What’s your life motto? 8: What’s your fitness regime? Off season – some serious hammock work…..on season – Powerlifting, weight training and cardio RPM class at the gym twice a week and skate training twice a week. 9: What’s your roller derby goal for 2015? Help my team get better and win games……..and get some training time with some UK teams when I head back there. * Stay tuned to the blog as we probe more Northland Nightmares roller derby players and pick their brains for nuggets of pure wisdom and tidbits of utter nonsense. This entry was posted on March 18, 2015 by nnderby. It was filed under EVENTS! .